This week’s summit is affording India a major opportunity to build consensus on climate change. The Third India-Africa Forum Summit (IAFS) offers host nation India much in the way of opportunity. 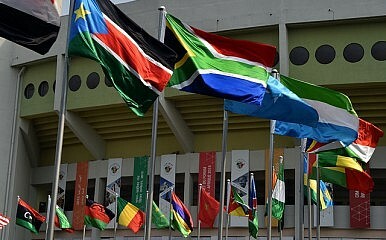 This is the biggest African summit in terms of attendance ever to be hosted by any country. Of 54 countries invited, 52 confirmed their attendance with at least 41 heads of state attending. Trade, poverty alleviation, and security cooperation are the major focuses for the summit, but another important area is climate change. India and Africa are highly vulnerable to climate change. In Africa, annual agricultural losses due to climate are forecast to be around seven percent of GDP by 2050. India stands to lose 1.8 percent of GDP. Besides agriculture, climate change could create significant resource scarcity and erratic weather patterns in both regions, which are ill-equipped to counter the impacts. In the run-up to December’s United Nations Climate Change Conference in Paris, a draft agreement was released in mid October. The draft sparked an angry response from the G77+ China, a 134-strong group of developing nations that includes. Led by South Africa, the group contended that the draft was a form of “apartheid” against developing nations, claiming that it favored rich nations and failed to address the initiatives developed nations need to take. The latest blueprint of the agreement avoided clarifying where the amount for combating climate change will come from and what it would be used for. The draft also dropped key demands of developing nations without engaging with the $100 billion finance promised by the developed world by 2020. The Indian government was also unhappy with the draft as it breached non-negotiable red lines. The U.S. has implied that emerging economies such as India should also contribute to the global climate finance pool, hitherto seen as obligatory for developed countries only. This has rendered virtually ineffective the principle of equity and historical emissions. India also questioned reports claiming that $60 billion of the $100 billion has been committed before 2020, as there was no clarity as to how it is being used and on the definition of funds. The issue of critical technology and climate mobility also remained unresolved. Although the contribution of the African continent to global warming is negligible, all but a few African nations have declared their Intended Nationally Determined Contributions (INDCs). Most of them have targeted reductions in greenhouse gas emissions. They have heavily invested in clean energy and adopted smart farming techniques. India, too, has also taken on more than its fair share, at least compared to the West. This opens up a space for India and Africa to come to common terms. As a growing economy, India is an ideal development partner for Africa. Resource-rich Africa is fast moving towards new democracies and growth economies. It will be an important partner in terms of political, strategic, and economic concerns for India. While India could offer Africa a major source of trade and investment, it may need African support for negotiating a seat on the UN Security Council and a better deal at the Paris summit. India and Africa have strong socioeconomic similarities, such as diversity, a colonial history, and developmental challenges and issues. Given their combined influence, India and Africa could play a crucial role in negotiating a joint position on climate change at IAFS. Even though mitigation occupies a large part of their INDCs, this week’s summit could help place the priority on adaptation, as both regions are highly vulnerable. Speaking on Tuesday, India’s External Affairs Minister Sushma Swaraj said that “The challenge of global warming can only be addressed adequately through technological solutions and financial resources to manage the transition.” Cooperation must be taken to a new level and a coalition space must be carved out. Africa requires $20-30 billion a year for adaptation, while for India to reach its INDC targets it would need $2.5 trillion (at current prices) between now and 2030 to implement all planned initiatives. If Paris is to end with a global climate deal, developed nations will need to take radical action to cut emissions, including support for developing countries in mitigation. Failure to do that will see the carbon budget exhausted with a few decades. Finance for now and far into the future will be the crux of the Paris deal in December. The developed nations have to do more on all their climate change commitments, as INDCs from developing nations does not obviate the responsibility of the industrialized world. The $100 billion figure should be considered the minimum commitment to 2020. The finance pool in the form of the Green Climate Fund will be an important funding mechanism for both India and Africa. It should help build early-warning and disaster-response systems, as well as resilience towards climate change impacts, in addition to supporting research and development. Given the scope of outreach towards Africa it represent, the IAFS summit this week could well act as a launching pad for India to reach a coalition of consensus on the pressing issue of climate change. Syed A A Farhan is a YFFP-Foreign Policy Fellow at Jindal School of International Affairs. In India, close to 1.5 million people are classified as internally displaced every year, many for climate change reasons.